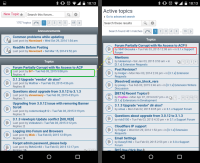 When a list of topics is viewed through the responsive layout of Prosilver (e.g. on a smartphone browser), information about the OP are replaced by information about the last post in that topic. That's useful to quickly spot changes at a glance [left side of the attached screenshot]. The same is not true searching for "Active topics" [right side of the attached screenshot] which keeps showing information about the first post which aren't really meaningful in this compact layout view. In fact this affects all kind of searches (based on search_results.html template). I think it would be desirable if search_results.html template behaves like viewforum_body.html when the viewport goes responsive. Reproducible: shrink the width of a desktop browser window until it goes responsive.